We put this dessert into the "you won't believe it until you've tried it" category. Omit peppermint extract and candy cane. 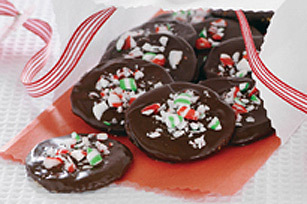 Spread each cracker with a thin layer of Kraft Smooth Peanut Butter before dipping into the melted chocolate.